I have had some enquiries about andouille from my prior post. 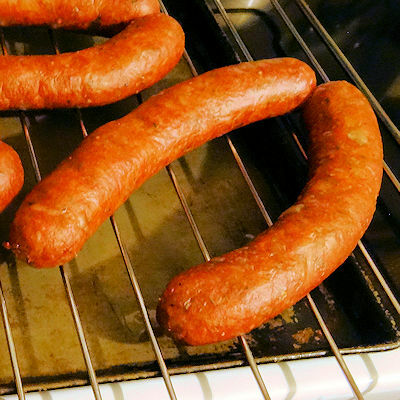 Andouille is a spicy smoked Louisiana sausage. It is commonly used in Cajun and Creole dishes like Jambalaya and Gumbo. However, it is also tasty eaten by itself or on a charcuterie tray. I have made it in a prior post some years ago but I have been refining the recipe since then and the questions led me to believe I should post my latest version. So, if you can’t find andouille for your cooking, here is how you make it. First, I often say you can make my smoker recipes by replicating the heat in your oven. Part of andouille is the smoke flavour. 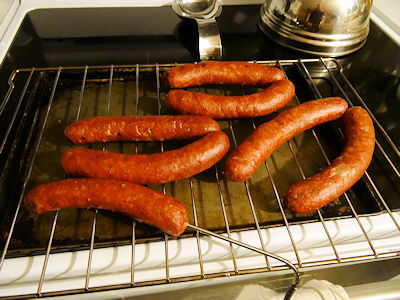 So, you can make this recipe in your oven and will get a very tasty sausage but it won’t be andouille without the smoke. Second, remember it is critical to keep the meat cold when making sausage. It just grinds better and gives a better consistency. Whenever you aren’t doing something with the meat, put it in the fridge. Third, the recipe calls for Prague powder #1. This is a curing salt and is also known as pink salt #1, Instacure #1 and several other names. Any curing salt that is 6.25% sodium nitrite 97.75% salt is fine. For this smoke, I used natural hog casings. They come packed in salt. The night before, I cut a 6 foot length for each kilogram of pork or a 3 foot length for each pound. I rinsed it well inside and out with cold water and then left is soaking in cold water in the fridge overnight. I rinsed the casings again with warm water and let them soak in clean warm water. I cubed some pork shoulder to 1 inch and weighed it. I put it in the freezer for 15 minutes. For each kilogram of pork shoulder, I chopped 40 ml of onion. That would be 1 1/4 tablespoon per pound. I ground the pork and onion through the medium plate of the grinder on my stand mixer and put it in the fridge for 30 minutes. Mix together the following per kilogram of pork. For example, if you had two kilograms, you would double these amounts. Spread the ground meat on a tray and pour the mixture over it. Mix it well by folding the meat in half, rotating the tray 1/4 turn and folding again. Do this for 3 minutes. Put the meat in the bowl of a stand mixer with the paddle attached. Beat the mixture with the paddle for 3 minutes and put the meat back in the fridge for one hour. While the meat is chilling, do a fry test by cooking a small patty of the mixture and tasting it. The fry test will not be the same as the finished product but will give you and idea if there is way too much or too little of any ingredient. I put the casings on the horn of my sausage stuffer and filled the casings. I took the casings and twisted them at 8 inch lengths. I cut every second twist. 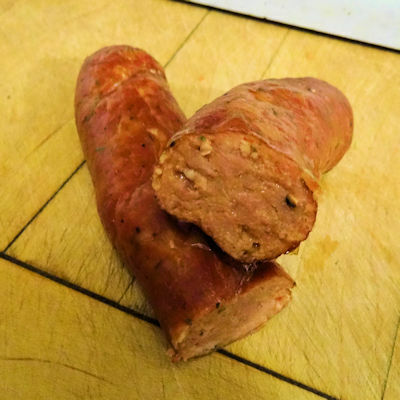 Andouille traditionally comes in two connected chubs. I put the chubs in the fridge overnight. For the double smoke, I didn’t turn my Louisiana Grills pellet smoker on. Instead, I lit up my A-Maze-N Tube Smoker and put it in the unlit smoker. It was quite cold so I took advantage of the cold smoke to also did some smoked cheese while I was cold smoking. I let the cheese smoke 3 hours and the sausage smoked for 5 hours. I put the sausage in the fridge overnight. I fired up my mini WSM with just a few coals burning to 150 F. I put the sausage on. I cooked them for an hour and then opened the dampers a little bit at a time to slowly bring the temperature in the smoker to 180 F. I smoked until the internal temperature of the sausage was 155 F. This takes several hours depending on your smoker. If you get too much heat too fast on the sausage, it will fat out and have a poor texture. If you did a cold smoke, you can finish it in your oven to have a better control of the heat. Just set the temperature at the lowest setting and slowly raise it to 180 F and cook to an internal temperature of 155 F.
Let the sausage sit on the counter for 2 hours and then refrigerate overnight before using. This is a medium hot andouille as She Who Must Be Obeyed does not care for fiery hot. It has a great texture and smoky flavour that goes great in other dishes. I love andouille! Cut the pork to 1 inch cubes. 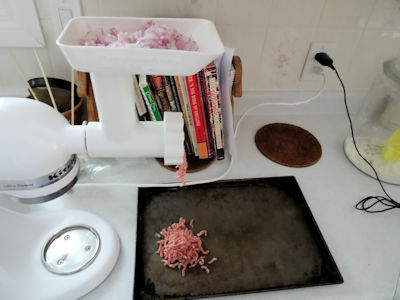 Grind the pork and onion through the medium plate of a grinder. Mix the mixture into the pork well by hand. Put the pork in the fridge for 30 minutes and fry some of the mixture up to taste test. Put the pork in the bowl of a stand mixture with the paddle attached. Mix at medium speed for 3 minutes. Put the pork in the fridge for 1 hour. Stuff the pork into the casings. Twist at 8 inch lengths and cut every other twist. Preheat a smoker or oven to 150 F or the lowest setting. Put the sausage in and cook for 1 hour. Gradually increase the temperature to 180 F.
Continue cooking the sausage to an internal temperature of 155 F.
Let rest on the counter for 1 hour and refrigerate overnight before using.